New Caledonian crows make and use complex tools in the wild, but this does not necessarily indicate that they are especially clever – it could be a largely instinctive behaviour, similar to the web-building of spiders. Our experiments (see Development) have indeed demonstrated that New Caledonian crows possess an inherited predisposition for tool use – so how smart are they really? To assess animal intelligence, scientists often examine how individuals perform in novel situations, where evolution cannot have provided them with a built-in solution, and where they have not had a chance to learn what to do through trial-and-error. We have used this approach with our captive New Caledonian crows, by looking at how they select or make tools when faced with novel problems. 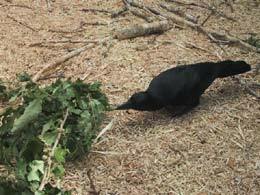 Firstly, we asked whether the crows could choose tools of appropriate dimensions (length and width) to get food. We placed food at different distances inside a transparent tube, and provided sticks of different lengths: we found that they nearly always chose sticks that were long enough to get the food (Chappell & Kacelnik 2002). We then gave them the challenge of poking a stick through a small hole to dislodge food, and a leafy oak branch from which to make tools: the subjects adjusted tool width to the hole’s diameter, and very rarely made tools that were too thick to fit through the hole (Chappell & Kacelnik, 2004). 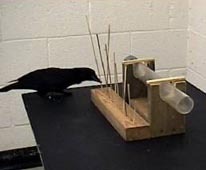 These experiments demonstrated that the crows do not just pick tools at random – they appear to examine the problem first and then pick an appropriate tool. Windows Media Player (.wmv) movie of Betty modifying tool diameter. Quicktime movie showing Betty choosing a tool from a number of different length tools which were provided. 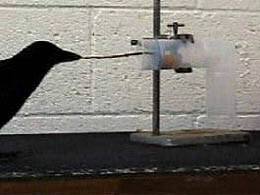 It was recorded after the experiment described in Chappell & Kacelnik (2002): in the experiment, the first tool inserted in the pipe was recorded as the bird's choice. This movie shows Betty choosing a tool from a number of different length tools which were provided. It was recorded after the experiment described in Chappell & Kacelnik (2002): in the experiment, the first tool inserted in the pipe was recorded as the bird's choice.